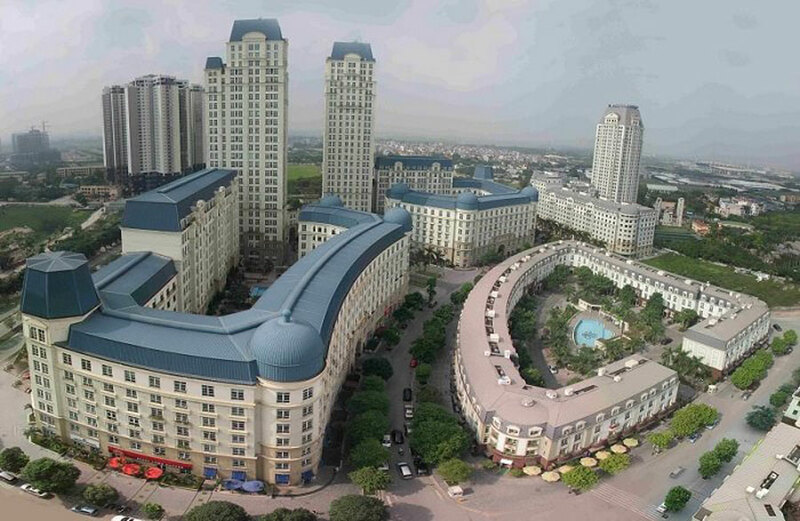 According to VARS statistics, in 2017 Hanoi has 54 real estate projects offering products to the market 34,217 apartments, 950 villas and 999 houses. The majority of housing units offered for sale in Hanoi are condominiums. This increases the proportion of apartment housing in total new housing supply in Hanoi to 90% of total new housing. The apartment market in Hanoi recorded a large supply of apartments priced at market prices, with 60.1% of products priced at less than VND25 million / sqm concentrated in Ha Dong district. Mai, Dong Anh and Tu Liem. The middle segment ranges from VND 25 to 35 million / sqm, accounting for 26.7%, mainly in Tu Liem, Nam Tu Liem and Thanh Xuan districts. High-end and high-end segment priced at VND 35-45 million / sqm accounted for only 12.2% of total supply in Thanh Xuan, Cau Giay and Tay Ho districts. In 2017, the super high-end apartment segment in the new year offering price over VND 45 million/ sqm in Hanoi only accounted for a very small proportion. According to the area, the apartment area is 70sqm – 100sqm accounting for the largest proportion (45.8%), followed by the apartment area of ​​50sqm – 70sqm, 100sqm and 120sqm. VARS said that in 2017, the total number of successful apartment transactions in Hanoi reached 20,776 units. According to VARS, generally in the beginning of 2017, the volume of apartment transactions in Hanoi increased from 3,624 transactions in the first quarter to 5,417 transactions in the second quarter, 4,955 transactions in the third quarter and a relatively strong increase to 6,780 traded in the fourth quarter of 2017. The trading volume decreased slightly in the third quarter of 2017 due to the time of July lunar month and the time of travel and rest of many families. The volume of products traded was still low-end apartments, accounting for 52%, followed by medium-end apartments with 42% of total apartment transactions in Hanoi in 2017. In the fourth quarter of 2017, 701 villas, adjoining houses and shophouses were traded. The projects were concentrated in suburban districts such as Ha Dong district and Hoai Duc district. For the whole year 2017, the total number of villas, adjoining houses and shophouses in Hanoi reached 1,096 transactions. Real estate brokerage said that with low-rise apartment, this type of price increase is not much. According to calculations, the price increase over the same period in 2016 about 5%. The average price for this type is VND 22 million / sqm. Mid-end apartment price increased by 6% compared to 2016, average price of VND 29 million/ sqm; luxury apartments and super high-end (over VND 45/50 million /sqm) does not increase compared to 2016. Remarkable land projects, Real Estate Association of Vietnam emphasized that most of the land value in the project in each region fluctuate around 10%. The area of ​​Ha Dong district, Hoang Mai, Thanh Tri have average price VND 25-50 million/sqm; Long Bien district, Gia Lam average price of VND 30-50 million/ sqm; In Dong Anh district, the average price is VND 30 million / sqm. You are reading the article Hanoi: The average apartment occupies half of the total transaction, the land price increases by 10% in the Real Estate category at https://realestatevietnam.com.vn/.Any information sharing, feedback please email to info@realestatevietnam.com.vn, Hotline 0909890897 (24/7).